Kŭmgangsan or The Diamond Mountain is named for its hard sparkling cliffs, which look like Kŭmgangsǒk (금강석), the Korean word for diamond. Kŭmgangsan is the second highest mountain in North Korea, with its highest peak, Pirobong, reaching 1,638 meters. Kŭmgangsan, part of the Taebaek mountain range which runs along the eastern edge of the Korean peninsula, is located at 38.58 N latitude, 128.17 E longitude, in the recently created Kŭmgangsan Tourist Region, formerly part of Kangwŏn Province. Kŭmgangsan was the first place in North Korea opened up to allow visits by South Korean tour groups, beginning in 1998. Kŭmgangsan is a national treasure for the Korean people, with its life-giving beauty. Long considered a source of particular power and spiritual renewal, the reopening of the mountain to visitors from South Korea bears particular significance as a step toward reuniting the heart as well as the land of the divided Korean peninsula. Kŭmgangsan has been known for its beauty since antiquity. It is covered in forests, and the area around Kŭmgangsan has some of the highest levels of precipitation in Korea. The mountain not only features a landscape formed by erosion, but also a great number of deep ponds and waterfalls. The mountain consists almost entirely of granite and diorite, which have been weathered over centuries to create a wide variety of shapes. It is estimated that there are over 12,000 picturesque stone formations, ravines, cliffs, stone pillars and peaks. Major peaks in the northern section include Yǒngrangbong (영랑봉, 永郎峰/1,601m), Oknyǒbong (옥녀봉/1,424m), Sangdǔngbong (상등봉,上登峰/1,227m), and Obongsan (오봉산,五峰山/1,264m), and in the southern section Wǒlchulbon (월출봉/1,580m), Ilchulbong (일출봉/1,552m), Chailbong (차일봉,遮日峰/ 1,529m), Mirǔkbong (미륵봉/ 1,538m), Paekmabong ( 백마봉, 白馬峰 /1,510m), Horyongbong (호룡봉,虎龍峰, /1,403m), and Kuksabong (국사봉, 國士峰 /1,385m). 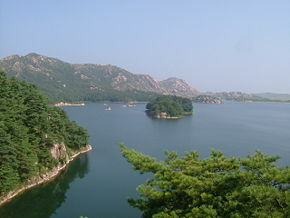 Kŭmgangsan is commonly divided into three areas: Outer Kŭmgang, Inner Kŭmgang, and Sea Kŭmgang, each with different geological and topographical features. 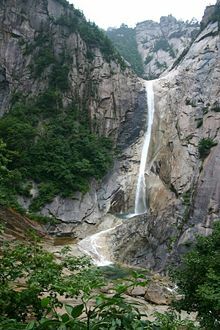 Oekŭmgang (외금강, 外金剛), or Outer Kŭmgang with its rough terrain and plummeting waterfalls is considered Kŭmgangsan's masculine manifestation, and is noted for the large number of peaks, such as Jipson Peak (rock of ten thousand formations). Naekŭmgang (내금강, 內金剛), or Inner Kŭmgang manifests a softer side of the mountains with hundreds of streams and pools, valleys and breathtaking views. Inner Kŭmgang's Manpok ravine is popular with tourists. Haekŭmgang (해금강, 海金剛) or Sea Kŭmgang is known for its lagoons and stone pillars. The mountain is called by different names as the seasons turn. Kŭmgangsan, Diamond Mountain, in the spring; Bongraesan, verdant mountain in the summer; Pungaksan, autumn foliage mountain in the autumn and Gaegolsan, skeleton mountain in the winter. There are many old temples around Kŭmgangsan, although not all are preserved in good condition. Probably the best known temples are Jangan-sa and Maha-yon. Other features of the area include: Sea Manmulsang, Kŭmgang Gate, Samil Lagoon, Piro Peak, Myongyong rock, the Baektap ravine, Manmulsang, Kuryong pond, the Upper Pal pools, Sujong Peak, Ongnyu ravine, the Hanha Stream, and the Sibi waterfalls. Since the Korean war in the early 1950s, until recently, there had been no surface traffic permitted between North and South Korea, and the few South Korean tourists who were permitted to visit the North had to fly there via a third country, usually China or Japan. Since 1998, South Korean tourists have been allowed to visit Kŭmgangsan, initially traveling by cruise ship, but recently more commonly by bus. In 2002, the area around the mountain was separated from Kangwŏn Province and organized as a separately administered Tourist Region. The land route connecting the region to South Korea was re-opened in 2003. A rail link exists on the North Korean side up to the border, but as yet no tracks are laid between Gangneung and the border in South Korea. The Kŭmgangsan Tourist Region is thought to be one way for the North Korean government to receive hard currency from abroad. Therefore the official currency of the tour is neither the South Korean won nor the North Korean won, but the US Dollar. Since 2003 the food and lodging services for the South Korean tourists have been provided by North Korean staff. The area is being developed by Hyundai Asan, who operate the tours and also have plans to expand the site with a proper ski resort to complement the current sleigh course, and complete golf courses. These plans for expansion, however, are in their earliest stages. Since 1998 an average of approximately 200,000 tourists a year have visited the Kŭmgangsan area. In June 2005 Hyundai Asan announced the one millionth South Korean visitor to the area. In July 2008, Park Wang-ja, a 53-year-old South Korean tourist, was shot twice and killed when she entered a military area, according to the North Korean government. She entered the military area by crossing over a sand dune. Forensic tests suggest that she was standing still or walking slowly when shot. This contradicted the North Korean claim that she was running and did not heed warnings. Immediately after the shooting, the South Korean government temporarily suspended tours to the resort. In August 2008 the North Koreans announced that they would expel "unnecessary" South Korean workers from the resort. Before the closing of access after the 2008 shooting, a few Americans were also allowed to visit by arranging tours through a South Korean tourism agency. The Diamond Mountain is one of the most spectacular tourist sights in Korea, including ragged cliffs, waterfalls, lagoons and mineral springs, rock formations, peaks and valleys. Manmulsang (Ten Thousand Things) is an area of fantastically shaped cliffs and rocks. At the entrance to Manmulsang is a group of three enormous standing rocks named the Three Fairies (Samsǒn). Other rock formations of every size and shape include Ansimdae (Peace of Mind Lookout), at the opening of the Manmulsang area, Mangjangcheon Spring, with its sparkling water and Haneulmun Gate (Heaven's Gate), a round hole in the stones, that looks like a gate to heaven. Kuryong Falls (Nine Dragons Waterfall), with a drop of 74 meters, are an impressive site, one of Korea's three most famous waterfalls. Legend says that nine dragons once inhabited Kuryong Lake, the pool at the foot of the falls. Hiking further up from Kuryong Lake, you can reach Kuryong Rock, with a spectacular view of deep valleys and high elevation lakes. Okryudong Valley the most picturesque valley in Outer Kǔmgang, containing Okryudam, Kǔmgangsan's largest mountain lake. Sangpaldam (Upper Eight Pools) is located across the Yeondamgyo bridge above the Kuryong Falls and up 370 steep steel stairs is the Kuryongdae Cliff observation point, 880 meters above sea level, giving a spectacular vies of the Upper Eight Pools. Sejongbong Peak appears to the left as you move from Okryudong Valley to Kuryong Falls, and gives a clear good view of Outer Kǔmgang and Birobong Peak. Sujǒngbong Peak High above to the northwest of Onjǒngri, Sujǒngbong sparkles with granite and rock crystals after each rain. There is a large plateau at the peak where one thousand people can rest after their climb and enjoy the view. Cheonseondae Cliff offers a stunning view of Outer Kǔmgang. Mangyangdae Cliff shows several of Kǔmgang's peaks, including Birobong Peak and also offers a bird's eye view of Sea Kǔmgang. Dongsǒkdong Valley, between Jipsǒnbong Peak and Sejonbong Peak can be found the Yǒnchundae area where spring first arrives in Kǔmgangsan every year. Dongsǒkdong Valley also offers a view of the East Sea. Old photo of Podukam Hermitage, poised on the edge of the mountain. Now in disrepair, it is not safe to use. Naegangdong Valley (Inner East River Valley), about 43 kilometers from Outer Kǔmgang's Onjǒngri, marks the beginning of Inner Kǔmgang, with its rich natural resources. The Changansa Temple grounds are is located in Inner Kǔmgang, along with Pyohunsa, the only temple on the mountain that is currently active. Sambulam a stone carving in Goryeo style shows three Buddhas on the front face and 50 smaller Buddhas on the back face. Podǔkam, the last remaining hermitage in Kǔmgangsan, is an amazing sight perched on a 150 meter cliff, and held up by a lone pole. The Sea Kǔmgang area extends for about 40 kilometers along the coast, and includes many striking rock formations and lagoons. Chongsǒkjǒng Cliffs at Sea Kǔmgang. Samilpo Lagoon has a circumference of about eight kilometers, is 9-13 meters deep, and is surrounded by 36 low peaks. According to legend, a king once came to the lagoon for a one-day visit but was so amazed by its beauty that he stayed there for three days, hence the name Samil (three days). You can rent a boat at Samilpo. Janggundae and Chungsonggak pavilions offer good views of Samilpo. Haekumgang Seashore beach is open for swimming in July and August, and is marked with the breathtaking rock formations of Haemanmulsang (Ten Thousand Things in the Sea). Chongseokjeong, clusters of rocks forming a one km long stretch of cliffs. Bongraedae pavilion offers a good view of Samilpo. Songdo a rocky island that rises 50 meters straight out of the water. Yǒnhwadae pavilion gives a view of Kǔmgangsan's highest peak, Birobong Peak. Waudo Islet is a rocky island in the shape of a cow. Although clear statistics are not available, it is likely that since Kǔmgangsan is located in Communist North Korea, the majority of the Buddhist temples are no longer active, and have not been kept in repair to the same extent as mountain temples on the mountains in South Korea. During Buddhism's peak in the Silla and Goryeo periods, there were four major temples recorded as being located on Kǔmgangsan, and up to one hundred or more smaller temples in the Kǔmgangsan area. Even during the Joseon Dynasty, when Confucianism was favored over Buddhism, the Buddhist temples on Kǔmgangsan remained active. However, after the effects of the Japanese occupation, the Korean war and the Communist regime in North Korea, reports show that only one temple on Kǔmgangsan remains active today. Pyohunsa Temple, in the Inner Kǔmgang area, was built in 670 C.E., located about two hours by bus from the Onjunggak tourist complex and the Outer Kǔmgang Hotels, is said to be the only active temple remaining on Kǔmgangsan. Once one of the most important Seon (Zen) monasteries in Korea, the temple now is said to be inhabited by only two monks. Many of the temple's cultural assets were lost during the period of Japanese rule. Changansa Temple, built during the Unified Silla period, was used during the Korean war as the headquarters for North Korea's Fifth Army and to house several hundred South Korean and about one hundred American prisoners of war. By the end of the war, the temple was entirely destroyed. 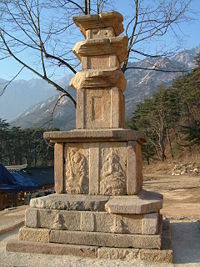 Late Silla period pagoda on the grounds of Kǔmgangsan's former Shingyesa Temple. Yujomsa Temple was destroyed during the Korean war and not rebuilt. Singyesa Temple, built during the Silla Kingdom in 519, with only one stone pagoda remaining since the rest of the temples were destroyed during the Korean war, is being reconstructed by a joint North-South initiative organized by the Jogye Order of Buddhism in South Korea and the Joseon Buddhist Federation, along with government bodies from both Koreas. In 2004 reconstruction began on the temple, financed in part by the Jogye Order and the Korean Buddhist Association, and the temple complex was completed in 2006. Its reopening was attended by leading members of both groups. Podǔkam, a small Buddhist temple only 3.3 meters by 5.3 meters in size, built in 627 during hte Goguryeo Dynasty, is located in Inner Kǔmgang at the top of a 20-meter-high cliff. Although the temple is still intact, it is structurally unsafe, so nobody goes inside it any more. Mahayǒnsa, another temple formerly on Kǔmgangsan, but destroyed during the Korean war. Kǔmgang Jeondo (General view of Mt. Kǔmgang) is a famous landscape painting by Jeong Seon during the reign of King Yeongjo. It was classified as the 217th National Treasure of Korea on August 6, 1984. The painting is currently in the collection of the Hoam Art Museum in Yongin, Gyeonggi Province on loan by the owner, Yi Geohui. While many of his contemporaries painters imitated the latest art trends imported from China, Jeong Seon ignored them, creating unique themes based on Korean landscapes. His catalogue of paintings of Kǔmgansan made him famous and the preeminent painter of his time at the age of 37. He eventually painted around 100 images of the mountains which still exist to this day. The artist’s love of the mountains influenced other artists to depict the Kǔmgangsan area and even encouraged mapmakers to make maps of the mountains. Although Jeong Seon made many paintings of Kǔmgangsan, this painting is the largest and considered his best. Like many of his paintings, Jeong Seon painted this landscape while actually viewing the mountains. The painting is 130.7 centimeters in height and 94.1 centimeters in width. It is painted with India ink. The painting is of Naekǔmgang, Inner Kǔmgang. 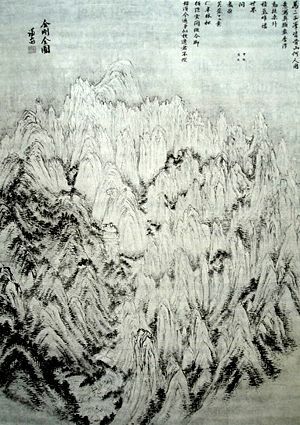 The painting depicts Kǔmgangsan's twelve thousand peaks. The highest peak, Birobong, lies in the background and water flows from it toward a valley called Manpokdong which is divided from the left and right. The high sharp peaks are depicted by the artist with lines painted up and down while he used a dotting brush method to depict the earthen peaks, making them appear relatively soft and lush. This composition harmonizes the contrasting sharp edges of the rocky peaks with the softer earthen peaks. Even if you visit the mountain yourself and tread on its every nook and cranny, how can your joy be compared with what you feel upon viewing this picture from your bedside? A view of Sea Kumgang from the sea. A view of Sea Kumgang. Poem by Kim Il Sung prasing his son Kim Jong Il, on his 50th birthday. Pyohunsa Temple, Kǔmgangsan's only active Buddhist temple. Old photograph of Singyesa, before it was destroyed during the Korean war. ↑ N Korea steps up row with South BBC News, August 3, 2008. Retrieved September 20, 2016. This page was last modified on 25 April 2018, at 15:05.